I found this while digging through some older stuff of mine. I really liked the way the planets looked as you zoomed out from them in Spore. So i attempted to create a procedural shader that would do something similar. A lot of work between there and here. Probably more things happened than what was listed, but it’s all a blur of syntax errors and OnGUI events. With my animation mentor class starting up soon progress will probably slow down. 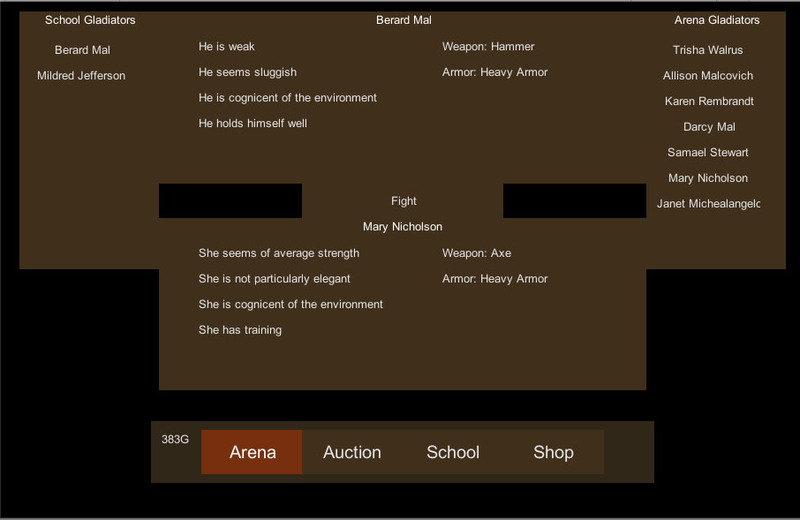 I am enjoying the creation process for my gladiator game and much progress has been made. 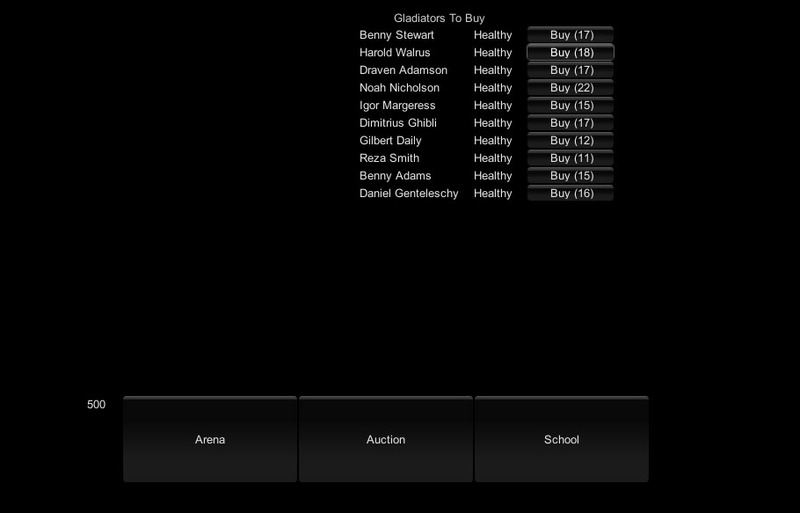 It has now reached the status of playable, which is very exciting. I’ve done the first build of the game and sent it to some friends. Players can see the gladiator’s stats (soon to be history.) Battle logs are printed out. UI is becoming resolution independent. The major change was under the hood. 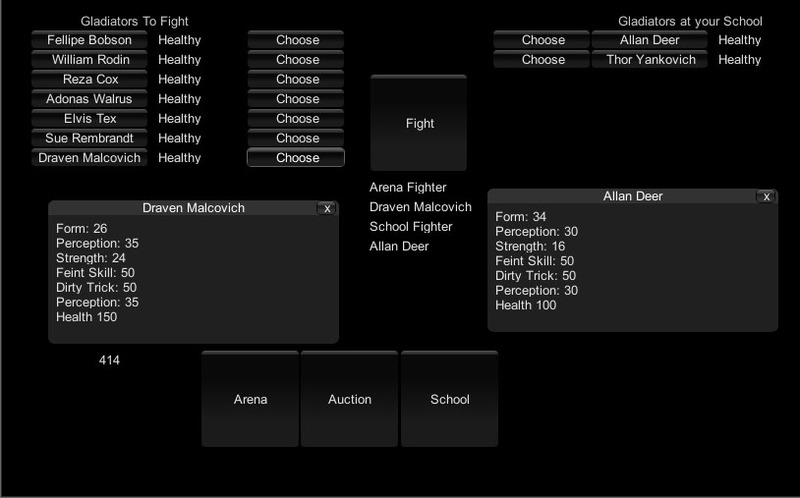 Revamped the battle system to be more scale-able, allow for skills and choice. 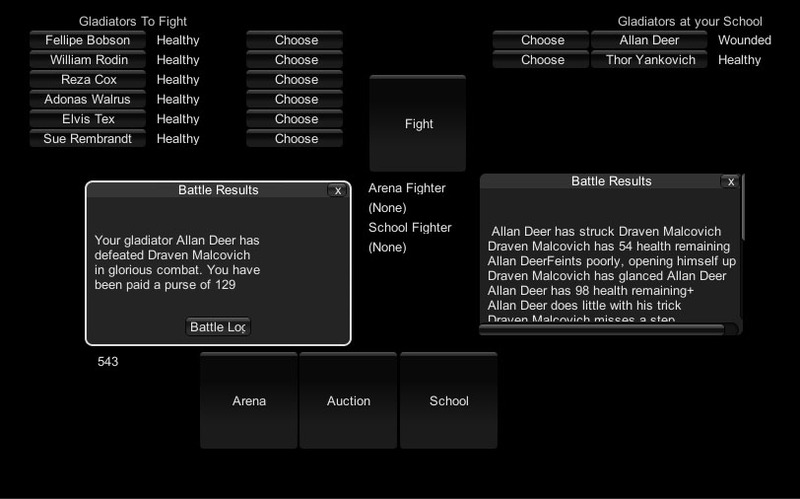 Victory, Allan Deer lives to fight another day. As for the prior decision between Ancient Rome and cyberpunk, I have decided on cyberpunk. I spent my adolescent years with Gibson, and Sterling. Running through the Redmond Barrens and the discussing the role of man and machine speaks well to me. Balancing is now the name of the game. Some fights end in a single blow, others go on for days of inept posturing. I want to get a more consistent pace. Then increase skill list, and implement gear. It’ll be a while, but I’m loving every minute. For a long time I’ve wanted a good gladiator game. I’m not sure what it is about the the idea of a 2 competitors fighting to the death, midst the roar of the crowed on top of the blood soaked sands of the Colosseum. Gladius was the closest I’ve played to this. Sadly it’s late game falters and there isn’t consequences to having your competitors die; I also lost my copy of this game so that’s out. I’ve also been meaning to find a programming project for myself. 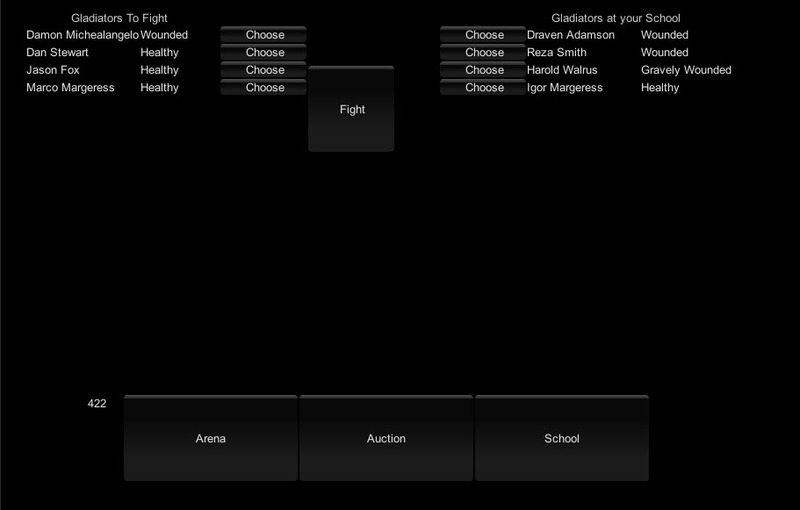 So far in my gladiator game it will generate a list of randomly created gladiators that you can purchase. Then you can have them fight a gladiator at the Arena. The loser of the match dies and is removed from the game. Finally you can go to your school where can pass time. Monthly upkeep will be paid, wounded warriors will heal and healthy warriors will train and get stronger. There are a few specific design ideas that I want shepard through this games creation which have already shown themselves. Consequences & Loss: This is a heavy subject matter that is often taken lightly. People are fighting, and dying, for the entertainment of others. These characters that you are training up, and investing in have a very real chance of losing their life, and many will. Character Attachment: While every character does have stats such as strength, speed, and health I want to abstract this data from the player. I don’t want the player to see “Lvl. 15 Fighter with 10 Str and 12 Spd and a couple nice abilities” I want them to see “Igor Margeress, the debtor from Carthidge who has a fierce determination to live and has been with me since the start.” So the player will not see stats, even though the cost of each gladiator is based on their stats, there is a random co-efficient so some are just better deals than others, but you as the player, don’t know. Maybe allowing players to name characters would be useful to this end, similar to XCOM. Some of the language in this post should hopefully have made you a bit uncomfortable. 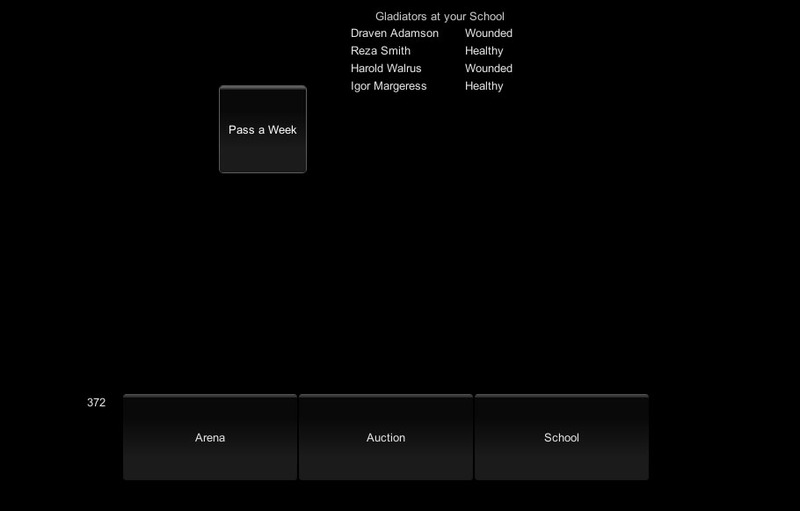 As the player is put into the role of the person who runs the gladiator school, the player is a slave owner. Buying and killing off people for money. I don’t know if I want this to be a central part of a game I make, for many reasons. I have reached my first major design decision of this game. Do I want to set it in ancient Rome, where I have history to pull from, rich aesthetic and culture to stylize, and the player becomes a slave owner. Or do I want to set it in cyberpunk, with chrome and glitz, monolithic corporations that cast shadows over the squallor and the sprawl. Where the player takes on a more corporate entity who buys up debt of people, or offers the stratified slum inhabitants a chance at a better life for risk of their own (hunger games almost). I don’t know, both have their value.